There are not many climbers or lianas in Estonia. Lianas are more common in the tropics, so this is somewhat exotic. 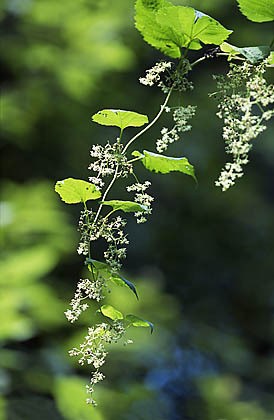 The hop climbs up along trees to a height of up to about 6 metres. The partly lignified stem twists around the tree going only to the right (clockwise), and attaches to it with the hooked spines on stems, leaf stalks and flower stalks. Hops have two kinds of flowers: male and female, which are quite unlike each other. The inflorescences grow on separate plants; such plants are called dioecious. The male inflorescences are long and sparse, the female ones are small to begin with but when ripe have grown to a length of four centimetres and remind of spruce cones. The "hop cones“ or simply hops are picked for beer-making.